"There are major exhibits devoted to: The Land of Canada, The People of Canada, The Growth of Canada, The Challenges to Canadians and Canada and the World, while the Katimavik exhibits relate to the Expo 67 overall theme of Man and his World. Separate are the Arts Center, The Sanctuary, a non-denominational place of meditation, and the Children's Creative Center, a place for directed play by children aged about 6 to 11 years. The Challenges to Canadians illustrate the response of Canadians to the factors of resources, distance, climate and topography. The emphasis is on energy as the means of using resources whether mining, agriculture or industry. The role of communication and transportation systems is another important subject. In the third section, visitors face personal challenges to greater achievement in work and recreation. The People of Canada section features a huge reproduction of a maple tree, of which the leaves are hundreds of colored photographs depicting Canadians at work and leisure." "Canada's Pavilion faces Montreal on a site of 11 acres (30,285 sq. metres) at the upstream end of Ile Notre-Dame. Its 125 exhibits show how the nation has developed, the factors that shape the lives of Canadians, and what Canadians are like." "Adjacent are the pavilions of the provinces of Canada. 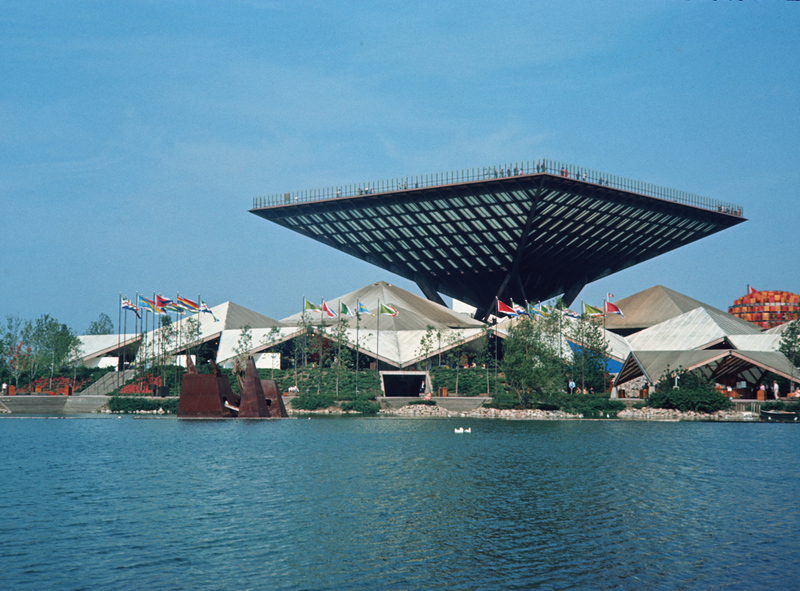 A huge inverted pyramid — the Katimavik — dominates the buildings of the Canadian Pavilion. It takes its name from the Eskimo word for "gathering place", significant reminder of Canada's welcoming role as host to millions of visitors from every part of the world. The pyramidal roofs of the principal buildings give a crystalline effect symbolic of the minerals and metals of Canada. Landscaped grounds slope through terraces to a canal and lagoon." "The Growth of Canada exhibit has a revolving theater to accommodate over 1,000 persons every half-hour. Audiences seated on a revolving platform will be passed through five motion picture theaters, each in a segment of the drum shaped building. The sixth segment will provide for entrance and exit. Each theater will show film devoted to a significant aspect of Canada's growth. Canada and the World is an exhibit devoted to world interdependence and tells of Canadians working with the United Nations and other organizations. In the 500 seat theater of the Arts Center, Les Feux Follets, famous Canadian folk dancing troupe, give daily performances. There will also be performances by outstanding Canadian artists in classics and popular song. Music, fashion parades and other attractions are presented in a 1,200-seat outdoor amphitheater. Restaurants and snack bars provide typical Canadian meals and refreshments; "The Tundra" Restaurant draws atmosphere from Eskimo tapestries, carvings, pottery and murals."